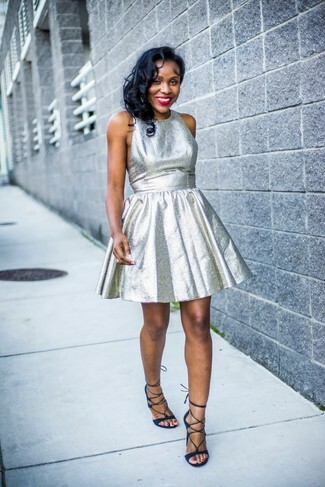 Make a silver fit and flare dress your outfit choice to steal the show. Black leather knee high gladiator sandals are the right shoes here to get you noticed. If you're on a mission for a casual yet stylish look, dress in a Vince Camuto metallic fit flare dress and a black leather biker jacket. Both items are totally comfy and will look fabulous paired together. Contrary to what you might believe, looking incredibly stylish doesn't require that much effort. Just dress in a Vince Camuto Metallic Fit Flare Dress from Nordstrom and you'll look incredibly stylish. Black leather heeled sandals are a savvy choice to complement the look. Make people go weak in their knees by wearing a Vince Camuto metallic fit flare dress. To bring out a sassier side of you, complete your outfit with navy suede gladiator sandals.